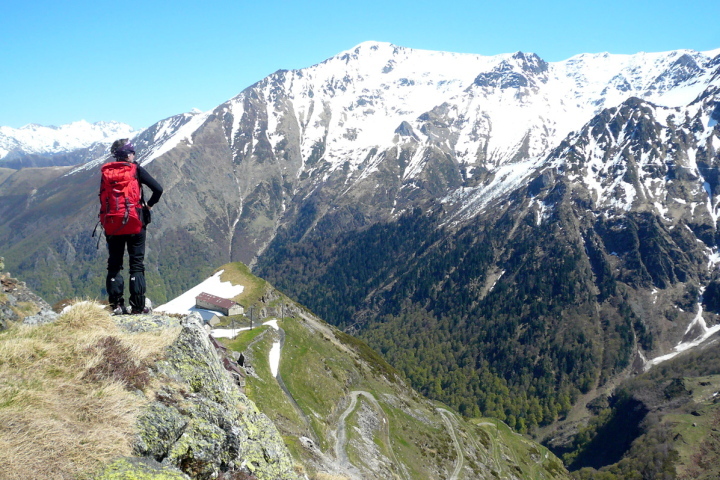 You’re a lover of spectacular views, challenging hiking and authentic mountain experiences? 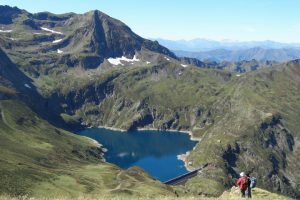 We’ve created this 5 day guided hiking holiday in the Ariege and Aran areas of the Pyrenees mountains with you in mind. 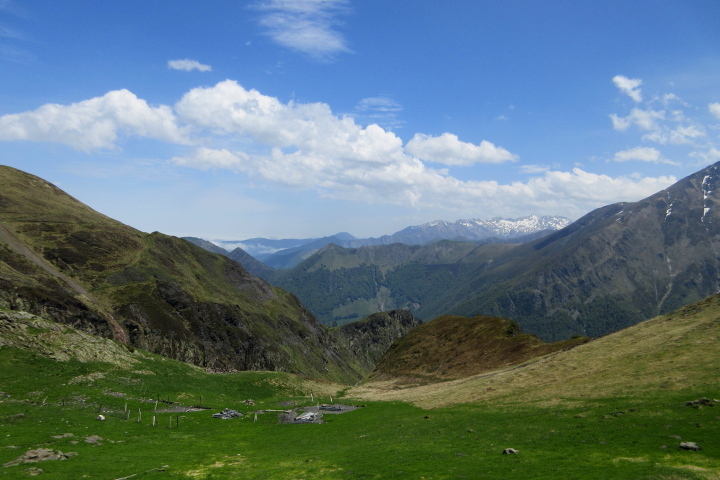 The Pyrenees mountains form a natural border between France and Spain. On this guided circular hiking holiday you’ll explore wild and unspoilt areas of both sides of the Chain. 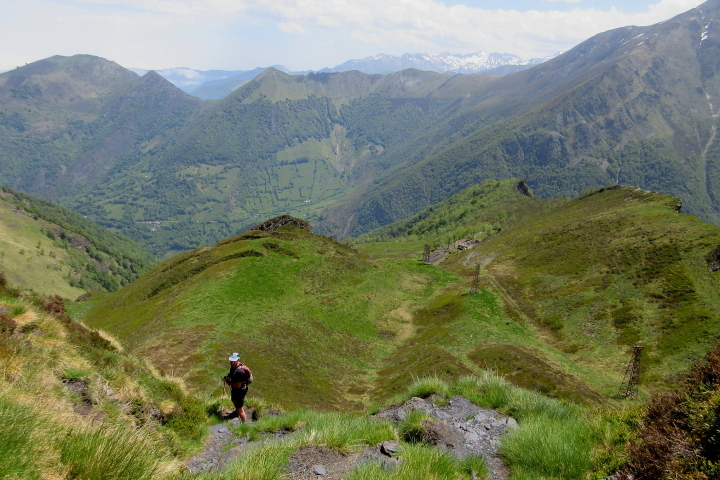 It will take you from the Ariege Pyrenees up and over into the stunning Aran Valley in Spain. Several of the high mountain passes are over 2400m alt so a good level of fitness will be required. 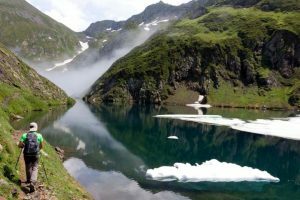 On this hiking holiday you’ll discover the environment of the high mountain shepherds and herdsmen, of smugglers and guides and of the folk that used to work in the high mountain mines. 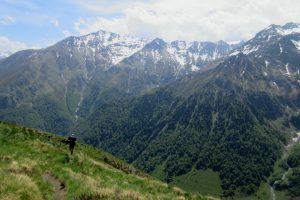 The hiking terrain varies from good woodland paths to rocky scree hillsides and everything in between. 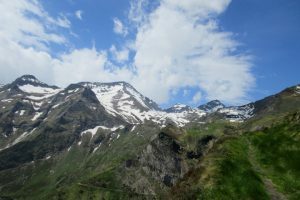 The maximum ascent you will have to tackle is 1640m on your final day and you can expect to be hiking for up to 9 hours. This guided hiking holiday should only be undertaken by those with a sufficient level of fitness. 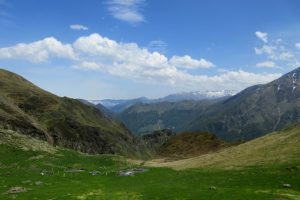 This high mountain environment is the territory of the threatened Lammergeier otherwise known as the bearded vulture, of the Griffon vulture and of golden eagles, the brown bear, ibex and chamois. You’re sure to see these mountain goat type animals scampering about the scree slopes and rocky ridgelines. They really do have amazng agility! In the summer months, the mountain flora is spectacular. On this hiking holiday you’ll see a huge variety of orchids, fields of mountain iris and numerous other flower species that are unique to the area. 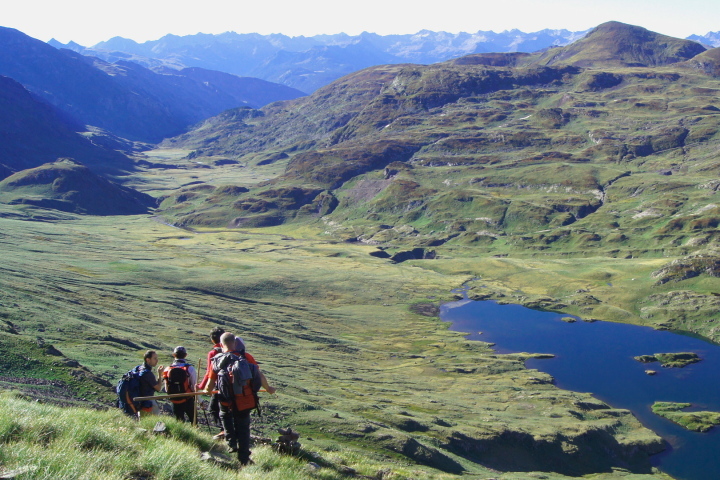 After breakfast you’ll be transferred to Eylie up the Biros valley from where the walking starts. 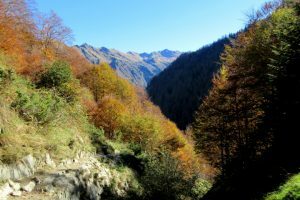 The path starts off steeply as it rises up through the woodland before emerging by the ruins of an old mountain hut. 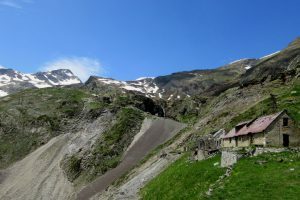 The path carries on upwards to the Col de Catouère at 1700m alt before climbing further to eventually reach the path that contours the hillside and leads to the Mines de Bentaillou. More steep climbing to the Col de la Serre d’Arraing and then descent to the refuge next to the lake. Accommodation in the refuge is in bunk rooms. 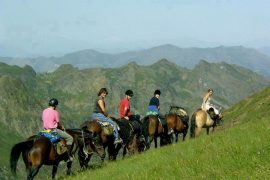 The food here is superb with home made meals created from locally-sourced produce. Make sure you try the homemade cordials and liqueurs too! 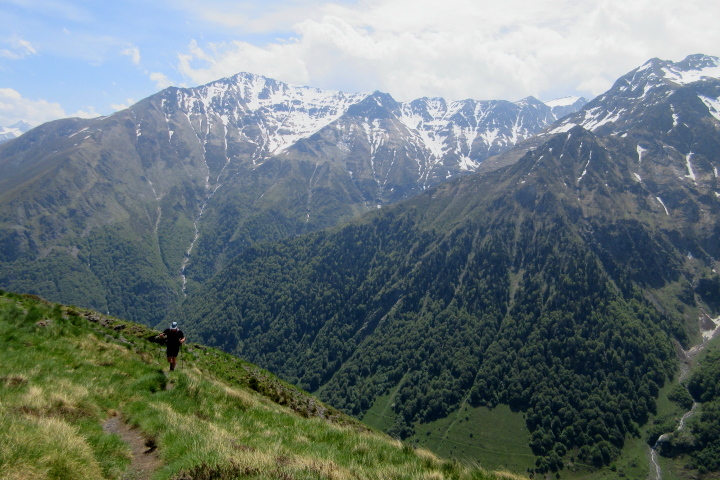 A long but spectacular day today taking you across the high mountains into Spain. 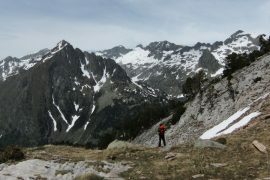 Your hike will take you up to a high point of 2470m and will involve some ascent on scree and possibly crossing compact frozen snow early in the season. 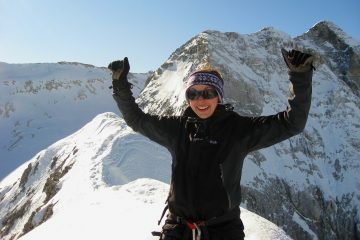 Walking crampons may be advisable. 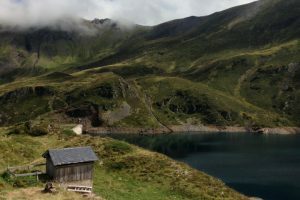 You will pass little mountain lakes, see raptors such as griffon vultures and maybe also golden eagles and bearded vultures up in this environment. 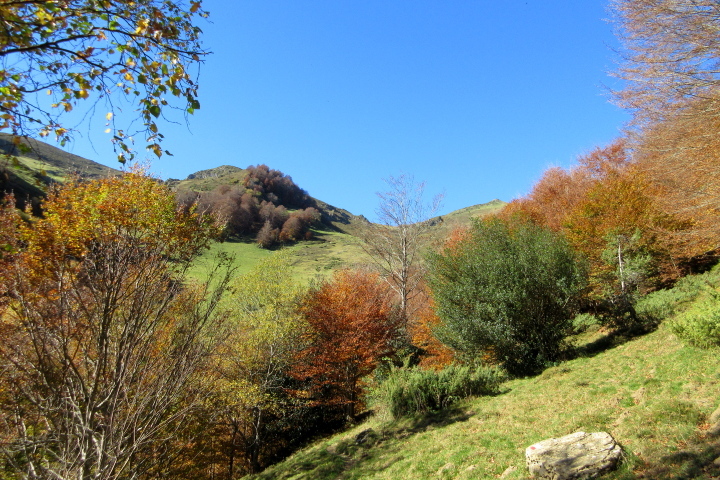 Look out also for chamois and red deer. 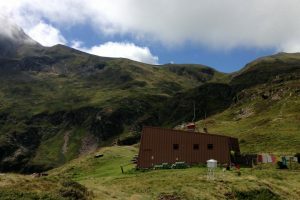 You will eventually arrive at the Montgarri refuge which is across the border in Spain at 1670m alt. You’ll get a good meal here as well as a shot shower and a night in a bunk room. 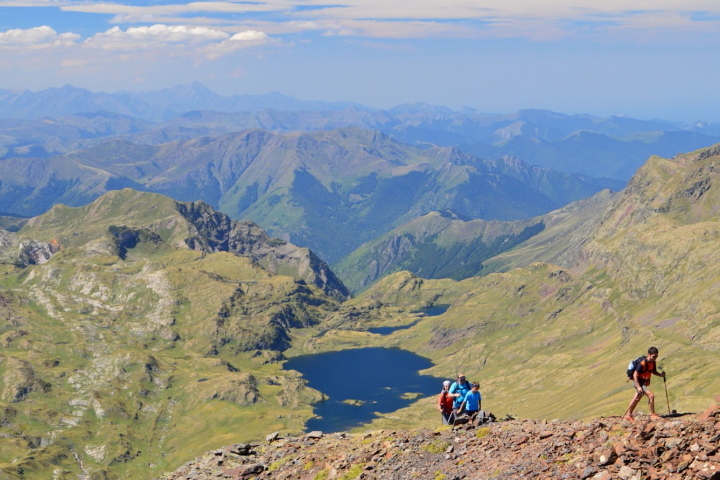 You will head back up into the mountains today with a hike back over the border to France and a high point of 2503m alt. 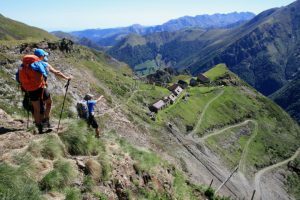 There are some pretty steep sections, both up and down, on today’s route including possible frozen snow sections and sections with handrails. This is a wild and beautiful mountain environment where you’ll pass mountain lakes and cross mountain cols. Make sure your camera battery is fully charged! 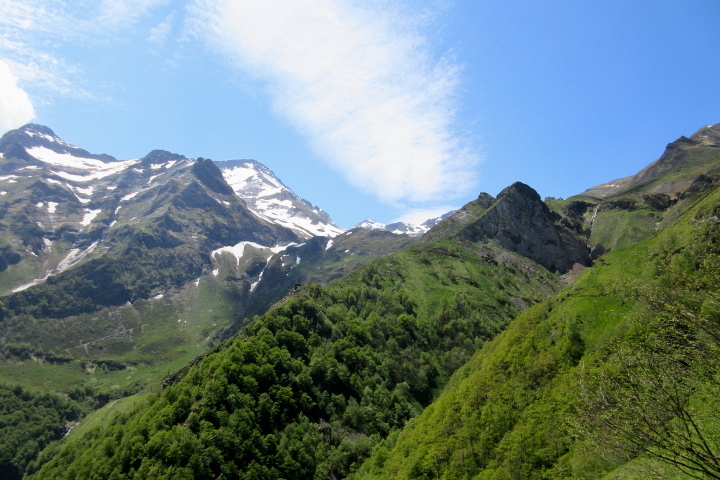 Your destination is the Estagnous refuge which is in a stunning setting at the foot of Mont Valier. The food and atmosphere here are superb. 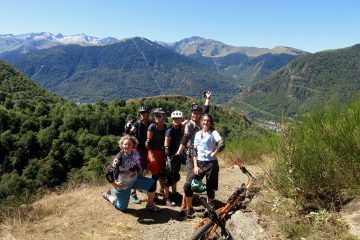 Today is the day with the most descent as you make your way down through a wild and unspoilt environment to the Riberot valley. You will spend the night at the Maison du Valier where once again a superb meal awaits you. 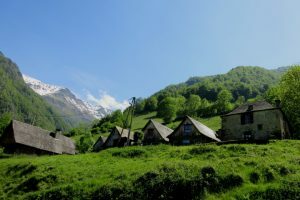 Local produce is used to create the freshly cooked meals. There are two choices today depending a) on the weather and b) your physical state. If you are still feeling fighting fit and want to end your hike on a high, go for the harder option which includes varied and sometimes challenging hiking. It starts with a steep climb straight up through woodland onto a ridge with stunning views (of course!). 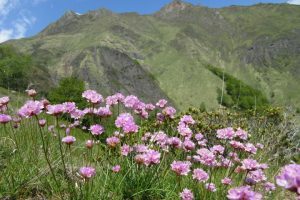 A sad day today as you are transferred back to Toulouse to make your way home.